In 2007, Josh Engel of Driftless Organics saw a hole in our local food supply: cooking and salad oil. He set out to fill this gap with the goal of producing a high quality, healthy and organic oil. 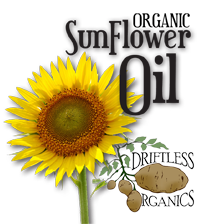 His vision has been realized: our Organic Sunflower Oil: the olive oil of the midwest. We grow huge fields of sunflowers and each August you can seem them filling up the ridge and valley landscape of our beautiful Star Valley, in the heart of the idyllic Driftless region. Our sunflower seeds are grown on certified organic land and are harvested and cleaned in mid-October. The oil is then cold expeller pressed to preserve optimal flavor and nutrient composition. This simple, temperature-controlled mechanical extraction method (never exceeding 120 °F) produces a pure, full-bodied oil with premium nutritional integrity.